Should your kids see the newest Disney live action film? Dumbo Movie Review | Safe for Kids?, an honest parent review of the newest Disney release. No spoilers! #Dumbo May contain commissioned links. Tim Burton at the reins of another Disney film? Should parents be worried? I’ll admit that I wasn’t thrilled about a live action remake of Dumbo. In fact, I was kind of done with Disney live action remakes in general. (Anyone else craving an original, non-sequel Disney film? Just me?) 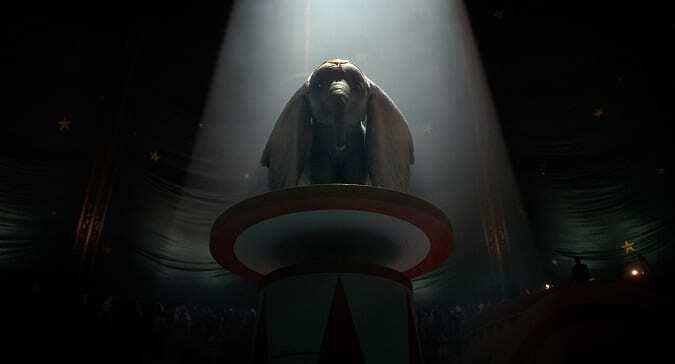 Does Dumbo finally get the right spotlight in the center ring? Or does this elephant come crashing down? In this Dumbo Movie Review | Safe for Kids?, I’m talking visuals, the story, that PG rating breakdown (are we talking another Incredibles 2 PG rating? ), and sharing whether I’ll be letting my own kids see this one. No spoilers. Well I’ve seen about everything when I see a CG elephant fly. 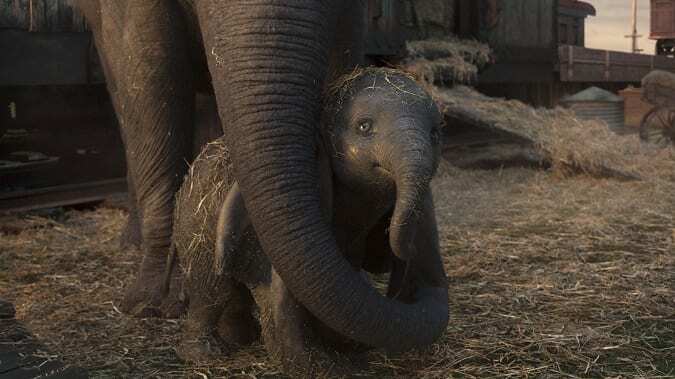 And the visual team did a good job creating a cute baby elephant that makes audiences go “awwww.” Combine CG effects with a Tim Burton direction, and you have a signature Tim Burton visual look. It honestly surprised me to see some more “cartoon” aspects brought back to the big screen – a nod to the original, I’m sure. 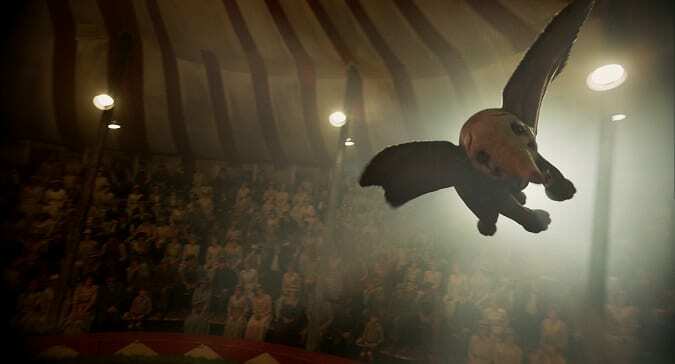 But if this live action Dumbo was meant to feel more real and connected to a new audience – I’m not sure the visuals did their jobs well. I admit that I have never been a Tim Burton fan. His overall dark and twisted movies while certainly have brought a new and respected perspective to the film world, have never been my cup of tea. So going into a live action Dumbo, I expected about the same level as excitement as the Alice movies. Ehh. In the end, it’s Dumbo a CG elephant as a main character. I had a hard time accepting that the main star was “real,” which made it harder for me to grasp that the story was “real.” Some really important aspects and characters were almost entirely removed from the film. (It’ll be obvious.) And the famous songs like “Baby Mine” got more of a nod than a spotlight. Michael Keaton, Danny DeVito, Colin Farrell and Eva Green were perfectly cast too. But even with good acting, I found it hard to relate to any of the main human characters – even the kids. While I didn’t 100% feel for the characters, I am thankful for a watery eye moment or two. And Tim Burton’s interpretation of the classic Dumbo story was unexpected of HIS character. Perhaps, even a glimpse of light in a dark world. A feel good movie from a dark man? Surprisingly, yes. There’s a huge difference in a Christopher Robin PG rating and an Incredibles 2 PG rating. Thankfully for this Tim Burton movie, I was shocked to see that this leaned more towards Christopher Robin. Is Tim Burton getting a little soft and hitting his Renaissance period? Maybe. But I appreciate the restraint from his usual twists and turns to keep this family movie a family movie. Is it 100% for kids? No. But let me explain with this Dumbo PG rating breakdown. Language. Total count of 2 very mild instances of H-E-double-hockey-sticks. Both prominent lines stated by Colin Farrell, it’s hard to overlook – but in this case the “brief mild language” holds true. No other swear words to be found. Violence. The PG rating also stands true for the peril/action. A man does get crushed. While not totally seen, it is implied that he is dead and placed (with blanket over his face) into a vehicle. 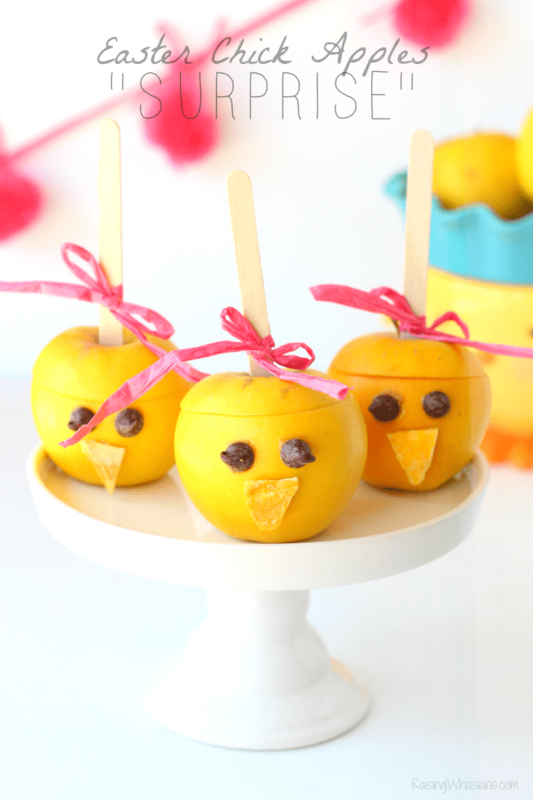 Young children may get scared and ask parents questions. Be advised. Very little suspense otherwise, you do see a man hit another man in the face. That’s it. Adult themes. This is a Tim Burton film. A huge dose of creepy theme-ing is to be expected, especially if you know his films well. An overarching theme of darkness, spooky imagery, and a “Halloween” feel – yup. All Tim Burton. Fire is also a main element used with a sense of suspense and chaos. And Michael Keaton plays the bad guy well, so well. Would I take my own children to see this film? My 10-year old son could handle this one no problem. My 6-year old kindergartner would probably ask me a few questions about the blanket man – but I don’t think this is too intense for her. I definitely could see my daughter crawling into my lap for a few of the spooky scenes – but again, everything ends happily in those instances. There is a lot of deeper family discussions that should arise from this film. And in a world of bullying, criticism, racism, and prejudice, it’s a film worth talking to your kids about, whether you see it or not. Uniqueness is not something to look down on, but something to hold your head up with pride. 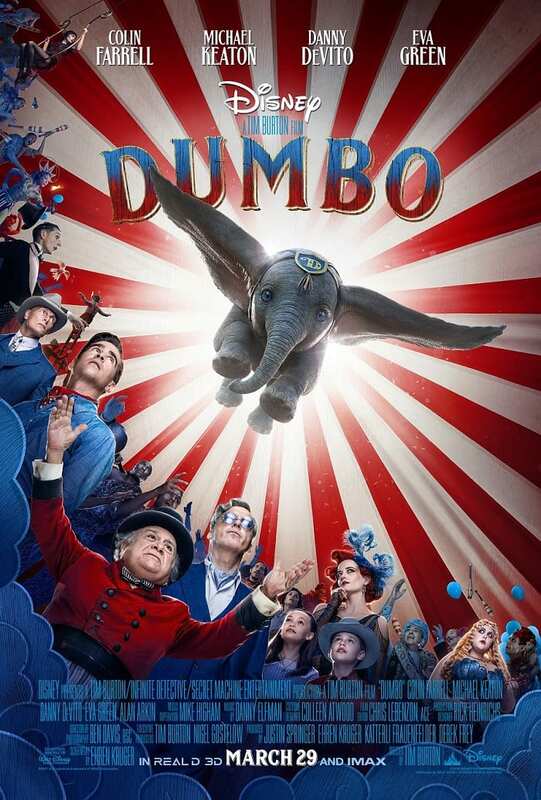 And this new live action Dumbo teaches our kids the importance of soaring above the cruelness of the world and how everyone is deserving of love. All multicultural aspects of the film are represented well and with respect, which is a huge relief given the racist undertones of the original cartoon film. It was the Dumbo live action remake that I didn’t ask for. It is the Tim Burton flick that I wasn’t excited to see. It’s also the movie that I went in with very little expectations. What I didn’t expect was to come out feeling just a fleeting glimpse of hope. In a dark world, sometimes you just need a “feel good” movie. And Dumbo is an unexpected flight that shows the world how our own uniqueness can soar. Will it win any Oscars? Probably not. But will it win over your family and a new generation of Dumbo believers? Unexpectedly, yes. Are you taking your kids to see Dumbo? 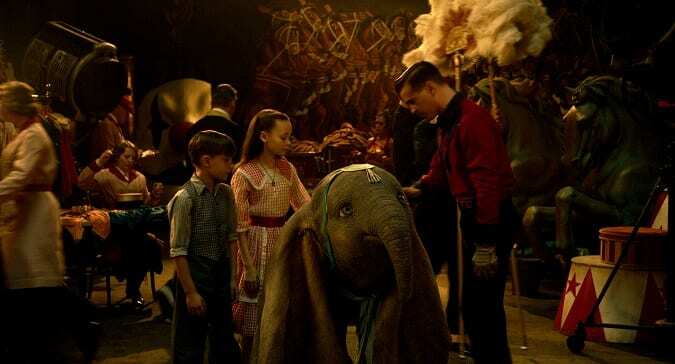 Do you think that the live action Dumbo is safe for kids to see? 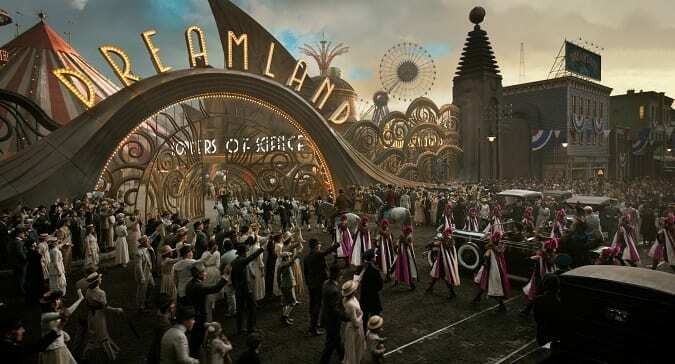 I was invited to attend a press screening of Dumbo in exchange for this Dumbo Movie Review | Safe for Kids? posting. Be sure to follow Raising Whasians via Facebook, Twitter, Google, Instagram, Pinterest and YouTube for more Disney movie updates, celebrity interviews, entertainment and behind-the-scenes info! Thanks for the review! Just a note- Colin Firth ( under language section) isn’t in this film!!! It’s Colin Farrell. Just thought i’d give you the heads up before the BBC Pride and Prejudice/ Historical-flick set descends upon the blog wondering when they’ll see Colin Firth pop up in this film.